You have spent a great deal of time and money while developing your eLearning course. But how can you know if it is effective? 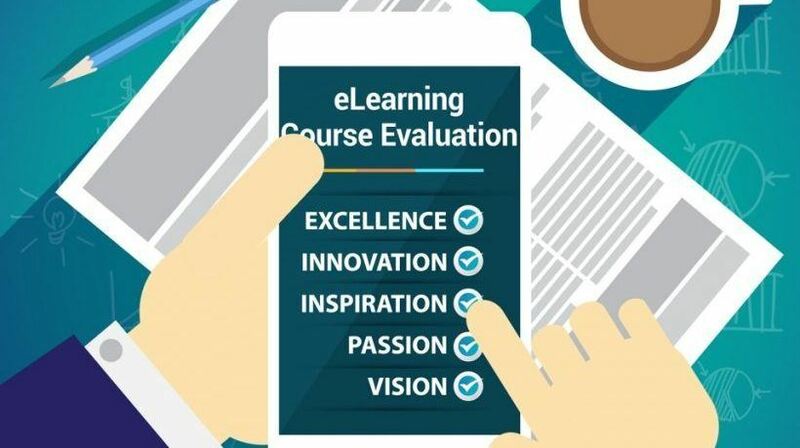 eLearning course evaluation allows you to assess the effectiveness of your eLearning deliverable and to keep improving it in order to offer your learners a powerful and memorable eLearning experience. In this article I will share why eLearning course evaluation is important, when to do it and, most importantly, how. Given that continuous improvement of your eLearning deliverable should be one of your priorities, you may be wondering when is the right time to evaluate your eLearning course. You need feedback, of course; but when? Before you launch your eLearning course or after its completion? The answer is simple: throughout. Whether you are still in the development process or your learners have just completed your eLearning course, you need feedback in order to move forward or in order to know what needs to be changed, so you can have better results next time. Evaluation should be an ongoing process; you need to constantly evaluate your eLearning course in order to keep improving it and making regular changes and updates. This way, your learners will appreciate your efforts by experiencing the eLearning course you are offering them to the fullest. But how can you conduct your eLearning course evaluation? First of all, you need to identify your eLearning objectives. What does your eLearning course claim to do for your learners? You have to be clear and specific about your eLearning goals. After identifying your objectives, you need to determine if your eLearning content and the learning material you have chosen serve these objectives; if you are happy with the answer (“Yes!” Vs “Oh…”), you can proceed to the next step. Interactivity is essential for an eLearning course, because it boosts your learners’ engagement and knowledge retention, both of which lead to a more effective eLearning experience. Have you succeeded in integrating enough interactive elements in your eLearning course? Of course, the more interactive elements you include the more time and maybe money you invest, but, then again, the more eLearning preferences you offer your learners. It may sound superficial, but it's not; a poor visual impact disengages your learners. Examine the look and feel of your eLearning course and determine whether the images and graphics you have chosen are aesthetically appealing and, of course, suitable; you don’t want unnecessary elements that will distract your audience from your content. Language is a key element of your eLearning course. You will want to determine if your learners are able to completely comprehend what they are reading or listening. Is your content well written? If you are planning to appeal to a wider audience, is the jargon you are using clear for all of your learners? Are the examples you give in your stories or scenarios relevant to your learners or they exclude some of them? If you have localized the content of your eLearning course, is the translation effective? Finally, if you are using humor to make a point, is it appropriate or are there some groups in your audience that might find it offensive? You will want to check all these things in order to ensure that the language you use in your eLearning course is comprehensible, respectful, and to the point. The technological aspect of your eLearning course is also important to be evaluated throughout. You will need to know if your learners use your eLearning course comfortably and, hopefully, intuitively. Are interface and navigation effective? What about your content’s display and sound? Do all the buttons work and the text and images look as they should? Can your learners easily access the internet while taking your eLearning course if they need to? Do your links work? There are several questions you should answer while examining the technology facet of your eLearning course and you should be quite meticulous while doing it. Another factor you need to check in order to successfully evaluate your eLearning course is the critical factor of seat time. There are several opinions on how lengthy an eLearning course should be. However, keep in mind that an effective length of time is between 15 and 30 minutes for each topic. Finally, you will want to evaluate the cost of your eLearning course. Even if you have successfully met all the aforementioned criteria, if your eLearning course is too costly, this might be a problem. Firstly, you need to ask yourself what is the cost of designing and developing your eLearning course (instructional design, working time, purchasing cost, etc), then what is the cost of running it (licenses and so on) and then calculate the cost per learner. Finally, consider including in your cost estimation factors such reusability, that considerably increases ROI. At this point you know which factors to consider when evaluating your eLearning course. Now, given that evaluation should be designed as an integral part of the eLearning course and is an ongoing process, let’s have a look at how you will be able to evaluate your product at all of its stages, in order for you to keep improving it and make the eLearning experience you are offering your audience more and more effective. As discussed above, eLearning course evaluation needs to be planned before the eLearning course starts, that is during the development stage. To do this, you need feedback from everyone who has a role in creating and participating in your eLearning course. To gain insight for how well your eLearning course functions, organize regular online or face to face meetings with your eLearning team. These meetings will have to cover all key issues, so define their agendas carefully. You will need to check the quality of your eLearning content, its usefulness and effectiveness, the technical support provided, timing, instructions, interactive activities etc. Consider documenting these meetings and take meticulous notes in order to effectively analyze the evaluation data. You can collect feedback from your learners by running focus groups from a sample audience, in order to evaluate the eLearning experience that your eLearning course offers. Evaluation from a sample audience in the early stages of your eLearning course’s development could lead to great improvements. A very effective way to create the questions for your evaluation is to align them with your eLearning course’s objectives. Furthermore, ask your potential learners if your online content is easy to understand, if the scenarios you are using are relevant to them, if the games you have probably included are motivational, if the language is appropriate, if the images and graphics are appealing, if the instructions are clear and if the interactive activities are engaging. Ask them everything you may have in mind, record their responses, analyze the data, and then revise and modify your eLearning course accordingly. By doing this, you will have the chance to prevent errors and resolve several issues before your eLearning course goes live. The most effective mid-course evaluation is basically done by tracking your learners’ activity. Tracking and recording your audience’s activity will help you gain a better understanding of the effectiveness of your eLearning course. The easiest way to do this is by using an LMS either hosted or cloud-based. The right LMS will give you the opportunity to collect important evaluation data, usually on a daily basis. In order to decide if the LMS solution you have chosen is ideal for you, you will need to evaluate it. This procedure might take some time, but it's definitely worth it. In addition, another way to evaluate your eLearning course while running is to observe learners’ behavior while they are participating in it by conducting focus groups and arranging online discussions. By challenging your learners to perform activities that reflect their knowledge and skills while taking your eLearning course, you can implicitly solicit feedback and make all the necessary changes accordingly. Now that your eLearning course is completed, you need to know if your audience is satisfied. The most popular way to evaluate your eLearning course after it has been created is by conducting surveys. You can include a survey at the end of your eLearning course and directly question your eLearning course design, relevance, and timing. Ask your audience if their skills/ knowledge/ work performance has been improved by using what they were taught in the eLearning course, if the instructional approach was effective, or if any part of the learning material was unclear. By doing a post-course evaluation you can collect valuable feedback and see what improvements you need to make in order to deliver an even better eLearning course next time. Finally, do not forget to evaluate your eLearning course’s financial aspects. Was there a positive return of investment for you? It is essential to know whether there was a financial benefit that outweighed the cost of your eLearning course after its completion, in order to revise your financial strategy or keep on following the same. All in all, evaluating your eLearning course is a key you should never neglect. In order to evaluate your eLearning course in the most efficient way, consider integrating evaluation procedures into your eLearning process and you will find that the benefits are invaluable. If you want to know how you can be fully prepared before you launch your next eLearning course, read the article Launching Your eLearning Course: 15 Things To Double Check and find out how you can give your next eLearning deliverable a thorough look before you roll it out for your audience.